I guess the back to school season has officially begun in stores. Now I look forward to getting cheap notebooks and pens, but as a kid I dreaded this time of year. I mean, I got physically ill with the thought of going back to school. While getting my toenails painted today I read a copy of Raising Arizona Kids magazine. In the ads section there was a company called First Day of School Fairy. The company produces gift packages and items to give to your child student on their first day of school. What a fun concept! The idea for the business came about when a family member died and the founders “inherited” two children in addition to the two they already had. Their child psychologist suggested they develop a new tradition to ease the transition. This planted the seed, and while reading a magazine article on children’s first days of school, she read one of the parents’ comments about a first day of school fairy comes to their house. This became a new family tradition for their family. She decorated placemats and the breakfast room so when her children arrived for breakfast in the morning, they could see the back to school fairy had come and they would then be excited about going back to school. 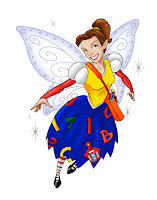 The first day of school fairy website has tips on making the first day of school go smoothly. You can also purchase products to host your own back to school party! Technically we got started two years ago. That is when we designed and developed the product line, started the trademark registration, found vendors, etc. It took a full year before we had actual product to sell. Our first summer to sell product was last year and this year has been a great success due to the advertising in both Raising AZ Kids and AZ Parenting magazines. What was the hardest part of starting up your company? Money!!!! Knowing what you want to do and having to make decisions solely based on money. When you have a vision and are passionate about it, patience is your best friend. All great things take time and prayer. What are the challenges of working at home? I love working out of my home and it will be hard when it gets bigger and we need to move it out of our home, but that will be bittersweet. Biggest challenge is not having the space to really spread out. The inventory took over the Living Room but I love looking at my product line, so I don’t really mind. It is really easy to process orders and ship them within 24 hours as everything is at my fingertips. my own interior design business (also out of my home) for the last eight years. When my kids were really little and all were in elementary school, I started doing the First Day of School Fairy to start a new tradition for my kids but also to quell the anxiety of that first day. It was a great distraction from all fear mixed with excitement that is part of that morning. Being an interior designer, it was natural and easy for me to decorate, which is what we did. The first placemats were all custom designed on our computer. Friends and family loved the idea and would ask me about it every year so we decided to create a product line and share the tradition with other families, hoping it would help them as much as it helped our family. We start usually in January with advertising and ordering more product. Then we go into full swing in June and July with sales and shipping. We were invited to participate in the Family Expo at the Cardinal Stadium in September, which we are considering even though school would have already started. The placemats are a year round use product, as are the pencils. What are your plans for Growth? some online marketing next year, budget permitting. Just working on getting the word out so that people know about the First Day of School Fairy. Seemed strange, but interesting; and their front page of site was well done. I find it hard to believe that they could do enough volume to be profitable with just that one targeted theme. Any idea what their annual sales is approximately? I don't think Ive ever seen anything other than ordinary Back To School marketing type themes. Hey - I read that article too - I thought it was such a cute concept!! The concept is cute, I will have to make their days special when they go to school!